Jean Webster’s classic epistolary novel of the coming of age of a college age girl at the beginning of the twentieth century, Daddy Long Legs, has been dramatized many times. 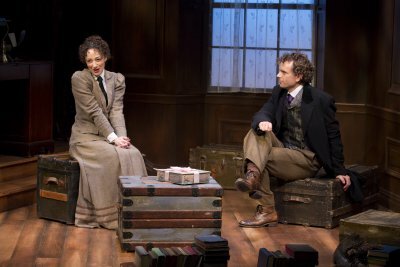 What makes this charming new Off Broadway musical now at the Davenport Theatre different is that it is played by only two characters and as a result it remains extremely faithful to the original book. Although the show written by composer/lyricist Paul Gordon and book writer/director John Caird, (Tony Award winner for the original Les Misérables and Nicholas Nickleby), the team responsible for the 2000 Jane Eyre, can’t compete with the big brassy Broadway musicals down the block, its very old-fashionedness and fully rounded characters make it extremely satisfying and endearing in a way that few musicals are today. Just try to not care about these characters. Told entirely in letters, Webster’s 1912 novel was dramatized by her as a 1914 Broadway play which ran 264 performances. It has been filmed eleven times, including five in English. The third Hollywood version was a musical for Shirley Temple retitled Curly Top. The 1953 London stage musical by Hugh Martin (Meet Me In St. Louis, Best Foot Forward) renamed Love from Judy was filmed for television the same year, and Johnny Mercer composed a 1950’s style film musical for Fred Astaire and Leslie Caron released in 1955. This new musical premiered in California in 2009 and has been seen in Chicago and London before making its New York debut with its original Jerusha Abbott in Megan McGinnis. Through her letters, Jerusha documents her intellectual and emotional growth in witty, revealing reports of her experiences. She has trouble adjusting at first to the social set of rich girls as she has so little knowledge of things that the other girls know and she is so unused to play. Her roommates are Sallie McBride who becomes her best friend and snooty Julia Randolph Pendleton who is too high born to notice Jerusha. Jerusha finds herself embarrassed by the things she has never learned, such as the fact that George Eliot was a woman and that Michelangelo was not an angel. She reads for the first time Great Expectations and Little Women, discovers Shakespeare and Shelley, and listens to Beethoven and Chopin with a sense of wonder. When it is time for summer vacation, her guardian saves her from a return to the orphanage with a time at Lock Willow Farm, her first experience of the country. Jerusha assumes that her guardian is an elderly man and she writes asking if he is bald or gray, but, of course, receives no answer. We find out early (Jerusha doesn’t) that her guardian is actually thirty-year-old philanthropist and socialist Jervis Pendleton, the uncle of her roommate Julia. 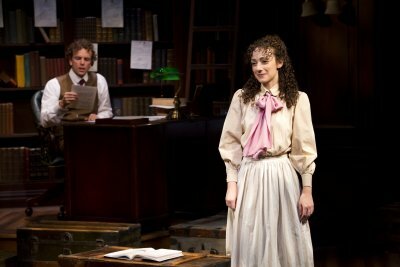 As the show is almost entirely sung through, Jervis appears in his well-appointed library reading her letters while Jerusha is down stage in her dorm room at the college. Many of the letters are used as duets as Jervis peruses her letters from the safety of his desk, but Jervis also reveals his feelings to us. Jervis is so charmed by their content and smitten with her that he contemplates answering her but always throws his responses away. Eventually, he hits on the idea of visiting his niece and meeting Jerusha as someone other than her benefactor. From Jerusha’s further letters, we discover that she is very taken with Julia’s young uncle. Can Jervis keep up his double role and how will Jerusha feel when she discovers his deception? Will Cinderella end up with her prince? As Jerusha Abbott, McGinnis grows up before our eyes, progressing from gawky adolescent to charming young lady. Her lovely soprano is given a workout as the bulk of the songs are hers. We find ourselves rooting for her eager, bright and clever heroine who can see both her strengths and weaknesses. As Jervis, tall handsome Paul Alexander Nolan (who gave the best performance in Doctor Zhivago in his Outer Critics Circle nominated performance as Pasha/Strelnikov last season) has the more difficult role as the listener and anonymous benefactor. However, he manages to also create a charming persona as he reveals Jervis’ insecurities, loneliness and alienation from his social class. Gordon’s melodic score played by a three-piece band suggests the period, though occasionally the use of the keyboard in Brad Haak’s orchestrations gives the songs a too modern sound. Among the outstanding songs are “The Color of Your Eyes” and “The Secret of Happiness” which become theme songs as they are reprised several times in new situations with new lyrics. Caird’s direction keeps the show moving even though a great deal is left to our imagination. David Farley’s unit set design always keeps the two locales before us, Jervis’s book-lined study where he posts Jerusha’s letters on his walls and Jerusha’s dorm represented by multiple trunks. However, the set also becomes Lock Willow Farm with a simple sleight of hand, and a visit to New York. His period costumes are equally ingenious allowing Jerusha to make simple changes to her costume as her four years go by. The subtle lighting by Paul Toben has been adapted for this production by Cory Pattak. 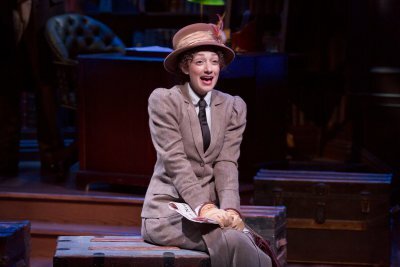 While one would not expect a two-character musical told entirely in letters to be stage worthy, the new Daddy Long Legs is a charming, moving tribute to the indomitable spirit of a remarkable young lady. It becomes a love story that has you rooting for the characters to end up together. Under the direction of John Caird, Megan McGinnis and Paul Alexander Nolan fully involve us in the story of how a good deed comes to change two people whose ideas are ahead of their time. it’s significant that Steve Martin has won five Grammy Awards for albums he’s made–two in the category of “comedy,” and three in the category of “music.” He loves to play the banjo (an instrument, incidentally, that has a prominent role, along with the fiddle, in the music we hear in “Bright Star.”) He’s collaborated with Edie Brickell on two albums. A jovial man’s 50th birthday is celebrated in this light, pleasant and edgy two-character musical with the audience involved as guests.